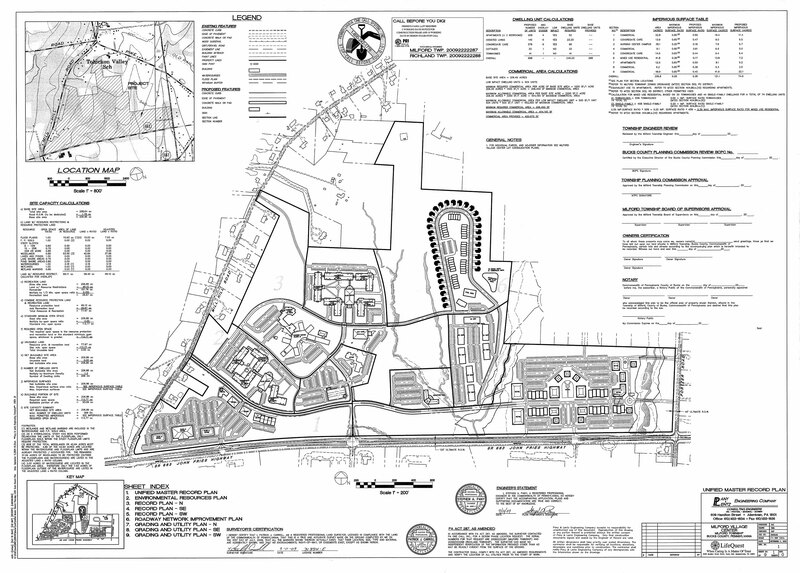 With uncertainties regarding the economy, residential development is nearly stopped with little significant projects being proposed .The vicinity of the turnpike has already experienced the development of the Hampton Inn, the Holiday Inn Express and the conversion of the Econologe into a Comfort Inn. The WaWa has settled in to routine operation. Construction of the Springhill Suites is completed next to the Holiday Inn Express and the Rodeway Inn has been demolished to make room for a Dunkin’ Donuts which is now open. Plans have been approved for another hotel behind the BP Amoco on the southwest corner of Rt. 663 and Quaker Pointe Dr. Pulse Technologies on AM Drive may soon be expanding. The largest building in Milford Township, a warehouse of close to 1 million square feet on AM Drive, is being used by a division of Georgia Pacific. Residential development has come to nearly a stop after completion of Valley View, Spinnerstown Crossing, Miller’s Run, Parkside (Allentown and Kumry Roads), Streamview (Allentown Rd) and Blackledge (Portzer). Plans have previously been approved for Brookfield (Pumping Station Road) for 106 dwellings. Milford Pointe (Milford Square Pike and Rosenberger Rd) started construction and came to a halt with the severe downturn of the housing market. Other plans are at various stages in the review process with activity being very slow (To track development activity, visit our home page on the Tuesday before last Wednesdays to review the planning agenda). The Unified Master Plan for Milford Village, a mixed-use development around the Upper Bucks Nursing Home, received Conditional Use approval and each phase will require both land development and conditional use approvals. This activity has been anticipated and plans have been formulated for the roads, sewer and water required. Of particular concern has been traffic impact. Over the past decade, Milford Township has developed a plan to protect the through traffic capacity of Rt.663. The basic concept has been to provide “reverse frontage” roads parallel to the arterial highway that can provide access to properties and prevent turning movements from degrading Rt. 663. At the same time, these feeder roads provide flexibility and multiple options for motorists to access local businesses and the turnpike without having to use Rt. 663. The construction of the Progress Drive access to the turnpike and the widening of Rt. 663 was the first stage of the overall plan. Other elements include the extension of Progress Drive from Weiss Road to a signalized intersection with Rosenberger Road at Rt. 663. Plans have been developed and permitting is complete for a parallel road on the southside of Rt. 663 behind the Hampton Inn. Construction has begun on this new road, which will connect Quaker Pointe Drive to the Turnpike. Plans to connect the end of Milford Square Pike to Quaker Pointe Drive have been accomplished. While the concepts are good, their implementation is difficult. Developers are building these new roads to accommodate the impact of new development projects. But not all development interests have been cooperative. Some try to have the taxpayers or other developers pay for improvements. And the timing of private development plans can make coordination of the construction of a road over numerous properties difficult. Also problematic is the severe shortage of state capital improvement funding in the Quakertown Area and the uncertain progress in moving capital projects. We are working with our legislators and PennDOT Project Managers to further progress on the Portzer Road Connector and Rt. 663 bridge replacements at Allentown Road, but fear these important improvements will be lost to “right-sizing”. 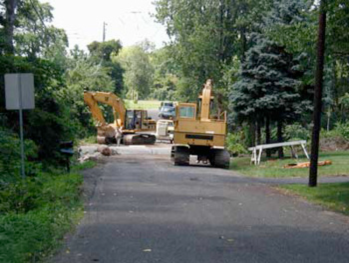 Milford Township pursues projects to better our community by creating long-term physical assets that improve our transportation, storm water management and park systems. Maintaining this public infrastructure involves snow and ice control during the winter and activities during the warmer months. Milford also manages green belts, trails and open space, and plants trees. All of these activities require equipment and a skilled road crew. Milford Township strives to enhance the landscape and functionality of its resources for our residents. Foot bridges over the scenic streams and waterways are no exception. Our Barrel Run bridge is made of stamped concrete to simulate wood planking, and animal prints are included to enhance your walking / biking experience. Milford Township is working to achieve the objectives of the NPDES Phase Two program. Most simply, the goal is to control pollution that can enter our waterways through the storm water drainage system. Besides identifying all discharges in the township and developing projects to improve water quality, Milford attempts to incorporate “Best Management Practices” in our road construction projects. For example, in storm piping projects, discharge is routed through energy dissipation and a settling area with bio-filtration to remove sediment and pollutants before water enters the streams. In this way we accept our responsibility to be responsible stewards of the environment. Joanne Drive had continuing flooding problems at its crossing of the Licking Creek. This problem may have been aggravated by several new homes built on large lots above Beechwood Acres with the clearing of trees and increasing of impervious surfaces. To address these concerns, we implemented a series of solutions to correct this longstanding problem. Storm pipe was installed to direct and control storm water on the downstream side of Joanne Drive in order to reduce flood volumes at the bridge. Considerable sediment accumulation was removed upstream to provide capacity for floodwaters. A detention facility was installed upstream. Work was completed on the Old Plains Road drainage project. Located between Zipp Road and Rt. 663, this project involved the installation of large diameter concrete pipe to control significant storm water and close deep ditches along the road. We thank the adjacent property owners for granting easements and cooperating through the construction inconveniences. Corrections and completion of the Fels Road reconstruction were completed. This project involved the installation of storm drainage pipe, drain widening and overlay (paving).